Under the correct circumstances, PEOs are a powerful tool that can be used to alleviate a company’s human resources burden while decreasing the costs associated with managing its employees. The model in which a professional employer organization operates is called shared or co-employment, which allows the PEO to act as the administrative employer of record for its clients’ employees. A PEO assumes responsibility, and in some cases the liability, for administrative tasks such as payroll, taxes, HR, employment law compliance and risk reduction. With the economies of scale generated by their size and specialization, PEOs can oftentimes negotiate lower insurance rates and provide more attractive benefits packages than a client can on its own. Through this relationship the client remains the operational employer responsible for determining who to hire/terminate, employee job function and wages, day-to-day activities, and the overall general strategic direction of the business. The co-employment relationship is designed to outsource routine human resources tasks and compliance so that the client company is free to use its time and energy on its core competency. PEOs provide these services in exchange for an administrative fee that is typically charged as a per-employee-per-month (PEPM) flat dollar amount or in some cases as a percentage of the client’s overall gross wages. The industry has been in existence for over 25 years and has grown considerably over the last five. More than 700 professional employer organizations are currently operating in all 50 states across the United States. They cover several million workers with over $80 billion dollars in annual revenue. What is a PEO’s Value Proposition? The benefits of choosing a PEO to manage employee related administrative tasks and benefits have helped fuel the industry’s growth. Selecting a PEO is a process for each business that is dependent on their unique needs and circumstances. Due to purchasing power, a PEO’s clients generally enjoy better rates on health insurance than they would otherwise be able to procure on their own. In addition to health insurance, PEOs typically offer ancillary benefits such as dental, vision, life/AD&D, short and long-term disability, 401k, flex spending and commuter pre-tax deductions. The bundling of all of these products onto one platform is what has earned the industry its reputation of being a one-stop-shop, single vendor solution for all benefit needs. Utilizing a PEO can also save the client the time and expense of conducting most employee related administrative tasks that generally distract companies from focusing on their core business. This component of the PEO solution is especially attractive to small and mid-sized businesses who can reallocate the time saved in these areas to focus on more revenue producing activities. PEOs also provide peace-of-mind by constantly monitoring and providing updates to their clients of all changes to local, state and federal employment law. In most cases the PEO will require their clients comply with these laws, thus significantly reducing each entities’ regulatory liability. Value added components to a PEOs core service offering include benefits administration, HR consulting services, human resources information system (HRIS) platform, employee recruiting, and risk and safety training programs. Recently passed federal legislation has been favorable to the PEO industry. With a new certification process and more favorable tax rules, the Small Business Efficiency Act (SBEA) has constructed a framework for even greater inclusion of PEOs within mainstream business practices. Perhaps the most impactful piece of business legislation in recent memory, the Patient Protection and Affordable Care Act (commonly known as Obamacare) has had a profound effect on small and mid-sized businesses both in terms of the need to provide their employees with health insurance as well as comply with the Act’s regulatory requirements. In addition to the compliance burden, experts anticipate that many small employers will slowly realize erosion in the types of plans they can offer their employees. To help solve this problem, some businesses are relying on professional employer organizations to help them secure more attractive healthcare coverage through the PEO’s access to large-group employer plans. The time, money and effort required to adapt to this new legislation can be prohibitive for many small companies. 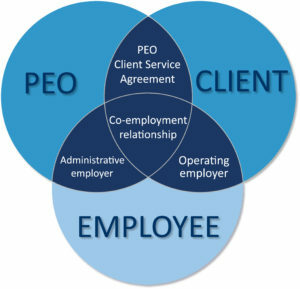 Due to the nature of its business a PEO can provide expertise and guidance to smaller organizations as they struggle to comply with the additional burdens created by the law. With the SBEA providing further legitimacy to the industry and healthcare reform generating demand for its services and expertise, PEOs appear poised to capitalize on current market trends to increase market share. Due to the abundance of choices, navigating the world of professional employer organizations requires diligence in order to choose the most appropriate fit for one’s business. As important, it is necessary to understand whether those services are being provided at the right price. Once these hurdles are cleared, the correct PEO relationship can prove to be extremely helpful in improving the client’s operational efficiency and cost effectiveness, leading to higher growth potential and profitability. What an excellent article–well done!! It immensely increased my understanding of the PEO and your industry overall. Keep them coming…..I need all the help I can get!! Thanks for the feedback and let us know what additional topics we can cover in the future!